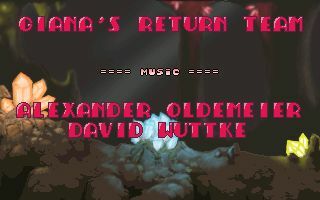 Giana’s Return aims to be a worthy inofficial sequel of “The Great Giana Sisters”. 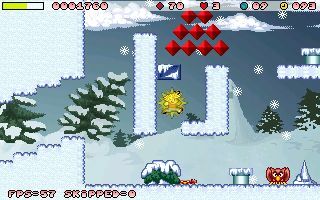 “The Great Giana Sisters” is an alltime classic Jump’N’Run game made in the late eighties mainly by Armin Gessert, Manfred Trenz and Chris Hülsbeck and gained massive attention as “Super Mario” copy, but still had it’s very own charme and fanbase. This release is a PUBLIC BETA to gain feedback and take suggestions for the final version. You are more than welcome to let the authors know your two or three cents. Awesome! Except I have no idea what a WIZ is. Is that some kind of European system? I’ll download it as soon as I get home, and I’ll give you my feedback in a few days. Insidious, the Wiz is the latest handheld console from GamePark Holdings. Have you heard of the GP2X or the GP32? This is the newest version. Hmm, I guess a white link on a white background doesn’t show up well. There should be a link under that “Check here for more info.” line, though. Nachdem ich die Entwicklung vom Spiel seit Jahren verfolgt habe, bin ich sehr froh, dass es nun veröffentlicht wurde. Ich habe mir wegen Gianas Return einen Wiz bestellt, und hoffe, dass er bald bei mir ankommt, damit ich das Spiel spielen kann. I hope it won’t be too long before we see a gp2x/linux/win build though. Wie viele hier bin ich jeden Tag auf dieser Webseite und auch total neidisch auf die WIZ Besitzer. Leider habe ich für so ne daddlkiste keine Kohle über. Ich freue mich aber riiiisig auf das release nächsten monat für win32. Ist es auch Vista kompatibel? Das mit buenzli habe ich net wirklich verstanden. ist das der Server wo man es downloaden kann? This was supposed to be released on the gp2x, not the wiz. I can’t understand why they said for all this time that the gp2x version would be first and now they are screwing us over. Christo: This works for GP2X as well. But you need to have Open2X, not original firmware. @Christo930: GP2x version within the next few days, we just got it running smooth but it wills till require minor investigation to be good enough for a public beta. Cool, thanks. I look forward to the release. do you have a donation account??? PS: Habt Ihr ein Spendenkonto?? ?